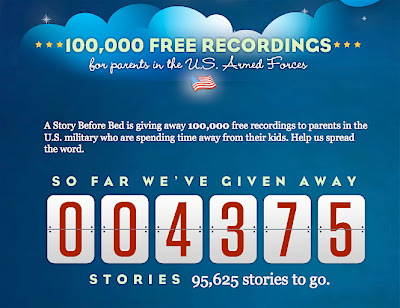 A Story Before Bed is giving away 100,000 free online recordings to deployed parents in the US Armed Forces. For their littlest loved ones to listen to back home. Just click on the image or visit here for more details. I know if Chris were away, our crew sure would love to hear him read them a goodnight story. And not just at bedtime. Pass this along to any military members you know, there are lots of stories left to be given away! I JUST had lunch today with a sweet friend whose husband just left her & their one year old daughter to Afghanistan for a year. I emailed her immediately! Thanks for the tip! Oh, thanks for letting us know! What a wonderful thing! So funny I was just on that site today. My 11 year old son's art teacher illustrated the book A Little Brown Dog. It's a great project/website.